So, What Is A Dog Training Collar? How Exactly Do Training Collars Function? Are Shock Collars Safe for Dogs? Do Shock Collars Work on Aggressive Dogs? Where Do You Put a Shock Collar on a Dog? Can Dogs Swim with a Shock Collar? How Much Range is Needed for a Remote Training Collar? 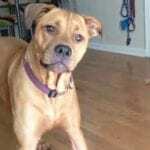 Will the Electric Stimulation From a Shock Collar Hurt My Dog? Often times, pet owners do not think positively about training collars because they are unaware of how it works and the positive benefits if can have while training their dog. When searching for a training collar for your dog, it is highly crucial to ensure that it is constructed well and is of a high-quality. Purchasing a collar that is cheap or is not the best dog training collar for your dog can result in injury if the wiring malfunctions. Below, we have curated a list of the top 9 training collars to help you find the right fit for your four-legged friend. This type of collar is specifically designed with electronic parts that allow it to be controlled through a handheld remote that should be placed around the neck of your dog. Training collars can either use shock, citronella solution and ultrasonic sounds. Training collars have an electronic receiving collar that is worn around the neck of your dog and a wireless control that allows you as the owner to use different types of stimuli while correcting your pet. You are also able to adjust the strength of the correction stimulus to ensure that it is not too strong or too weak. Each collar has two prongs that produce the correction when you utilize the remote, which allows pet owners to correct their dogs efficiently at home. The shock that these collars produce is enough to get the dog’s attention and make them feel brief discomfort, but they do not cause any short or long term injuries if used properly. Numerous studies of the physical and psychological effects of electric collars have been done with little to no significant adverse results. For more information check out the Electronic Collar Manufacturers Association. If you are still unsure of using an electric dog collar then you might want to check them out. They are tasked to make sure that the collars are safe and humane following the Animal Welfare Act. Dogs love to show affection by jumping onto people that they are comfortable with. However, sometimes they may do this on people who are small or fragile, like a child and senior, and can pose a potential injury. Their paws also carry particles from the outdoors that you might not want to be deposited onto your clothes. A dog training collar can assist in stopping this behavior by using the remote. Some dogs bark insistently over almost impossible-to-hear sounds. In this case, training collars can provide to be an easy and effective way to limit this behavior as you can utilize the remote when necessary. If your dog does not bark often when you are home, plenty of dogs excessively howl the second their owner's go off to work in the morning. Neighbors may not like to hear the barking throughout the day and it may pose a problem if a neighbor complains to your landlord. But, how can you correct a problem if you aren't home? Training collars can reduce this issue as some are designed to pick up the sound of your dog's barking and trigger a static correction each time it is heard. We all know dogs love to chew, but there are times when your dog might begin to deviate from bully sticks and bones to furniture, important documents, and footwear. This behavior can be controlled by stimulating the static correction when you notice your dog beginning to chew on anything besides the items that are intended for him to chew on. Just like chewing, dogs are famous for burying treasures all around the yard, only to dig them up and hide them again. This damages in the lawn can result in a lot of money lost if you are someone who has invested in their landscape and property. Over time, destructive chewing and digging will stop after your dog realizes that it will only result in an uncomfortable feeling. Dogs that suffer from aggression can make it uncertain to determine if they are every going to harm the owner or close individuals. A dog collar can help prevent this behavior over time as it shows the dog that forceful behavior will not be tolerated. This can also be used as a safety measure when walking a dog with aggression. While this may be your first time using a training collar, it is important to remember this is the first time your dog is wearing this type of product. Comfort is paramount as your dog will potentially be wearing this collar for the majority of their day. Through research, you will be able to determine which collar will be best suitable for the width of your dog's neck. Some breeds might need a collar geared to their head shape so that it properly sits on their neck. It is also important to keep in mind that no matter how good a collar is, it will not work properly and even can be harmful if it does not accurately fit your dog's neck. When researching online, always be sure to check out websites that allow verified customers to review the product. 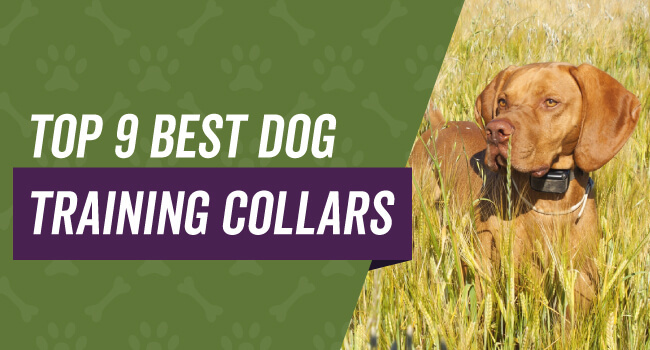 This may help you find a collar that is great for your dog's breed as most customers will state their dog's breed whether they love or hate the product. Just become one individual receives a faulty product or the product does not work well for a customer's breed, that does not mean that overall the training collar is not great. If people do comment about that they received a product that doesn't do what it is supposed to, try to find out if and how the manufacture handled this issue. Create a budget and try to find the best dog training collar within your price range. Some training collars cost a fortune, but will not be the perfect fit for your dog while others might be excessively cheap and fit your dog's neck size but not your dog's overall needs. Shock collars are traditionally used as a training tool, whether this means that you use it to curb unwanted behaviors like leaving a designated area or barking, you can also use it to help curb your dog's aggression. Shock collars work so well not because they cause your dog pain, but they redirect your dog's attention away from whatever has their aggressive tendencies coming out. You do want to ensure that your dog knows basic obedience commands before you try to curb their aggressive behavior because you won't be hitting the button to send a shock each time they display aggressive behavior. Instead, you'll send a quick shock when your dog ignores your obedience command due to them being distracted by whatever brings out their aggression. For example, if your dog reacts negatively to other dogs, use your shock collar to reinforce a command to "heel" and walk politely away or around the dogs. If they don't listen to your command, you use the collar to prompt your dog to pay attention to you instead of using it because they reacted. Although you may want to put the shock collar on your dog's neck with the prongs resting under your dog's chin, any folds or hanging skin can prevent the prongs from making contact. This can lead to random of inconsistent shocks that confuse your dog, and they can shake it loose when they shake their head. 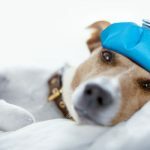 Instead, you may want to consider placing the pronged portion of the shock collar on one side of your dog's neck one day and switching it to the other side the other day. This will give the point of contact spot time to rest and heal between days. Your dog's neck is shaped vaguely like a cone with the more narrow part being close to your dog's skull and widening as it gets closer to their shoulders. Put the shock collar up high on their neck because it'll slow work down and settle on their neck as they move around from day to day. This depends entirely on your specific shock collar model because some are completely waterproof and some are resistant to water. If the dog collar is waterproof, you can safely submerge it into the water like it would be when your dog swims. However, if your shock collars claim that it's water resistant instead of waterproof, this means that it's designed to be alright if your dog goes out in the rain or in damp conditions. This type of shock collar wouldn't be safe for your dog to swim with, but if you have one that says it's waterproof, it is safe for your dog to swim with without any problems. It is a very good idea to double check your manual before you let your dog go swimming with it because this can be an expensive investment and you don't want to ruin it by submerging it in water if it isn't waterproof. Different shock collar brands have different range capabilities, and it all depends on how far you want to be able to allow your dog to go when they're out with the collar on. Many shock collars have at least a range of a half of a mile, and this is plenty of room if you're just using the collar as a training tool and you don't intend to allow your dog to roam without your around. However, other shock collars have ranges that start at half of a mile and go to one or two miles at their maximum point, and it's usually better to have larger range capabilities than it is to be too short. Ideally, your new shock collar should have a range of a half of a mile to a mile for training purposes. As long as your purchase your new shock collar from a reputable company, and you follow the instructions, the short answer is no. However, if you buy a low-end product from a non-reputable company, there is a good possibility that the shock collar could actually hurt your dog when it goes off. A good shock collar produces a pulse that goes through your dog's skin and into their muscle, and this acts like a static shock a human would get when they drag their feet across the carpet and then touch something metal. While it is unpleasant, the resulting "shock" tends to scare your dog more than it actually hurts them. As your shock collar's pulses go up in range, the pulse will get slightly stronger and strong. However, it should never get strong enough to actually damage any of your dog's skin cells, and it shouldn't leave any visible marks that you can see in your dog's coat or on their skin. This shock collar is excellent for dog parents who are on a budget as it comes in at under $50, and it features three training modes including beep, vibrate, and shock so you can choose how you train your dog. This collar also gives you peace of mind because it comes with a security keypad to help prevent accidental shocks. If you have multiple dogs, this training collar can easily support up to nine dogs on a single remote with each dog getting their own channel to set and train them with. You can set your static mode from 0 up to 99, and this makes it safe for dogs as little as 15 pounds up to larger 100-pound dogs. Dog parents were impressed that this budget shock collar had an extended range of up to 330 yards and that the remote came with a long battery life. Dog parents didn't like that you may have to press the remote one or two times to get the collar to respond appropriately if your dogs get farther out. Dog parents who want a long range training collar should give the Garmin Delta XC bundle a try because this collar gives you a maximum range of 880 yards or a half of a mile. 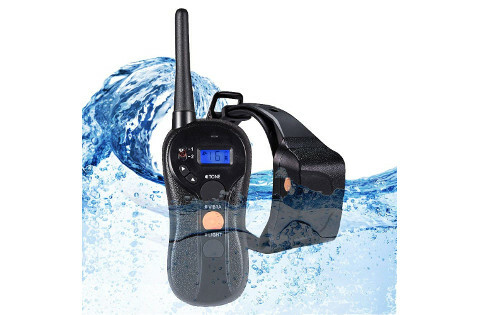 This collar features a rugged remote that is waterproof and very user-friendly with three large training buttons and an ergonomic design that's easy to hold and carry. You'll get 18 different levels of tones and vibrations including a shocking range that allows you to train your dog however you'd like starting with a warning and working up the intensity level. You can have up to three dogs on the same configuration at the same time with this setup, and the collar comes with both long and short changeable connector points for a snug and secure fit. Dog owners who purchased the Garmin bundle liked that the collar came with multiple attachment points because it gave the collar a snug fit, and they also liked that the setup was waterproof and rugged. They did point out that the shock levels may not be entirely consistent, and they tend to run slightly stronger than they'd thought. This no-shock training collar features 16 different levels of light and vibration with a backlit display and three working modes that allow you to customize the collar to suit your dog's training needs. The receiver is completely waterproof with a durable but light ABS shell and a rubber plug for the charging hole. The remote is very user-friendly and easy to operate with three distinguishable buttons and a bright display combined with an ergonomic design that is easy to grip, and it's lightweight enough to slip into your pack or carry around without fatigue. This collar charges within two hours for days of continuous use, and it has a battery saving option that switches the collar off when it's not in use. Dog owners who bought this no-shock collar liked that it comes with 16 levels of vibrations and lights that are easy to set, and they were happy that the collar is completely waterproof and lightweight. However, this collar may not work on more aggressive dogs or on dogs who have thicker fur because they won't be able to feel the vibrations well. The Puss and Pooch training collar is suitable for dogs starting and 10 pounds and going up, and it comes with 100 adjustable levels of vibrations, tones, lights, and shocks that are safe for smaller dogs. The entire setup ranging from the collar to the remote is designed to withstand water, sleet, and snow without a problem. You'll also get a more extended range with this bundle that allows your dog to run up to 328 yards and still stay in range of the receiver. This training collar comes with a replacement or refund warranty that is good for up to 10 years, and this gives you plenty of time to see if this collar is a good fit for your dog or not. Dog parents were happy that this collar came with 100 easily adjustable levels that include tones, lights, vibrations, and shocks that you can use on smaller dogs without worry, and they liked that it's waterproof. They weren't happy that it's too easy to set the power mode too high because it just clicks through them. This training collar is completely waterproof, and it features an adjustable shock mode along with four other modes including vibration, tones, lights, and static stimulation that have intensity levels starting at level 1 and going up to level 100. You can train two dogs from the same receiver, and this collar is safe for dogs starting at 10 pounds and going up to 100 pounds. The collar's receiver has a large backlit display that makes it easy to see how much battery you have left, the mode you have the collar in, and the intensity level, so you always know precisely what intensity your dog feels. This training collar comes with two different colors and designs, and it has a rapid charging battery and power saving mode that gives you days between charges. Dog owners who tried this training collar liked the large backlit display because it's highly visible and easy to read, and they also liked that they could use it on two dogs at once. Dog owners did mention that the button layout on the receiver was slightly tricky to operate. Anyone who needs a longer range and waterproof collar should take a look at the SportDOG collar because it works up to 880 yards and up to 25 feet underwater without an issue. You can pick from two different styles, three different ranges, and either six or three dog capabilities to customize it to suit your needs. This collar lets you quickly and easily set seven different tones for vibration and static, and it has both low and medium intensities that you can adjust as you need. You'll get a low battery indicator and a two-hour rapid charging capability that gives you between 60 and 70 hours of use per charge. 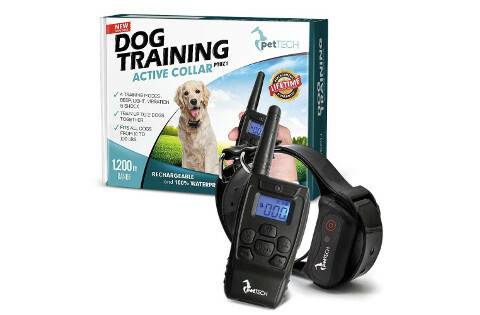 Pet parents who used this training collar liked that they could customize the transmitter button functions, and they liked that it comes with a training DVD and a detailed operating guide. They did say that the charging ports are extremely tight and that it can be challenging to connect and disconnect the unit to charge it, and that the buttons can be difficult to press. Both the collar and the receiver are waterproof and durable with the training collar set, and you can let your dog get up to 330 yards away from the receiver without having connectivity issues. The adjustable collar strap allows you to quickly and easily get a snug fit on your dog, and the collar fits neck sizes ranging from 15 to 22 inches. You'll get multiple training modes to use including vibration and static stimulation, tones, and shock mode that ranges up to 100 in intensity. You'll be able to try a few different modes until you find the one that suits your dog, and you get a warranty when you purchase this collar that lasts up to a year without registering the collar and three years when you register. Dog parents who bought this training collar with a remote liked that you could adjust it to fit several different sized dogs quickly and easily, and they were happy that it comes with a long training range. Dog parents weren't happy that the shock mode may not go off each time they need it to go. This training collar kit comes with two collars and a single receiver that lets you train or correct two dogs at the same time because each collar is on a different frequency. You get three different modes to try with your dog including tone mode, static shock with 1 to 16 intensity levels, and vibration with 1 to 8 intensity levels. The collars can communicate with the remote up to 1,000 feet away without connectivity issues, and you get easy access buttons on the remote that makes correcting your dog quickly and easily. This collar kit has batteries that rapid charge in as little as two hours, and you get between 15 and 20 days of use off of a single quick charge. Dog parents who tried the Bousnic Dog collar liked that it offers dual frequencies and that it comes with two collars that allow them to train and correct up to two dogs at one time. They didn't like that the collar's fabric is slick and it tends to slide around as their dog plays or goes about their day. This GPS training collar comes with over 100 US maps preloaded into the system that makes it easy for you to set boundaries in your surrounding area, and it also has an automatic recall that will go to your dog's collar if they cross the set boundaries. This compact and high tech GPS collar system an adjustable collar with a one-inch strap as well. You can set several modes with this collar including simulation mode, rescue mode, LED beacon, vibration, and tone to help train and locate your dog. It comes with a slightly larger display on the receiver so you can quickly and easily find your dogs, and you get automatic alerts when your dog crosses the set boundaries. Pet parents who bought this GPS training collar bundle liked that it sent out an automatic recall to the dog's collar when they crossed the boundaries, and they liked that the screen was large and easy to read. Pet parents did say that the user interface is complicated with several menus and different navigation screens. Our top pick for the best dog training collar is the DOG CARE Rechargeable Dog Shock Collar because it comes with several great features without the high price tag. We liked that you are able to choose between three training modes and a receiver that locks so you can accidentally shock your dog. We also chose this particular collar because it can support up to nine dogs that range in size from 15 pounds up to 100 pounds. Finally, it has a range of up to 330 yards, and this gives you more than enough room to train your dog.